Champs Elysees: Boulevard of Dreams: 8th Arr. Paris is the most chic city on earth, the location of your apartment should be also ! Several Cobblestone Apartments are located near the world famous Champs Elysees. The Avenue des Champs-Élysées is a major attraction in Paris. 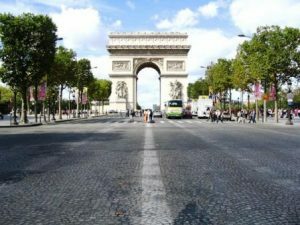 With its cinemas, cafés, luxury specialty shops and clipped horse-chestnut trees, the Champs-Élysées is one of the most famous streets and one of the most expensive strips of real estate in the world. Arc de Triomphe: Memorial built by Napoleon. Place de la Concorde: Beautiful Square and Location of Guillotine during the French Revolution. Tuileries Gardens: Formal Gardens with Fountains and Cafes. Louvre Museum: Palatial repository of innumerable masterpieces.